Killer Characters: The Superstition Mysteries are Nearly Here! The Superstition Mysteries are Nearly Here! Hello. I'm Rory Chasen. This is my second visit to Killer Characters. The last time I was here, I mentioned that I was going to be featured in the new Superstition Mystery Series. That series starts next month, in October, with Lost Under A Ladder, so I thought I would return and say hi again. Once more, I suspect I'll be showing up here often--but I still have some concerns about discussing superstitions and whether that can turn out to be bad luck. I remain a skeptic, of course, even though I now live in Destiny, California. The town is all about superstitions. That's clear from the townsfolk, the local stores and the souvenirs they sell, as well as the many interested tourists who come here to learn and--hopefully for shopkeepers like me--to buy stuff related to superstitions. In fact, my fingers are crossed about that. 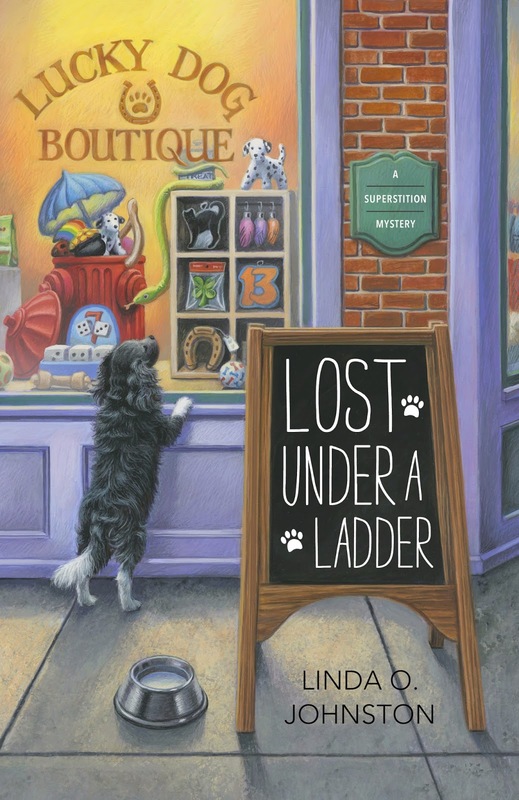 I'm managing the Lucky Dog Boutique for its owner, Martha Jallopia. Yes, she's the woman my black and white dog Pluckie wound up saving on our first day in Destiny. Black and white dogs are considered to be lucky, especially if you see one on your way to a business meeting. I've no doubt that Pluckie provides good luck to those around her, not just Martha... or me. Even having lived here for a little while now, I'm still seeking closure. As I mentioned previously, my beloved fiancé Warren died not long after walking under a ladder. The two things might have had nothing to do with one another, yet I'm still attempting to figure that out. I've been researching a lot of superstitions since I arrived here. It's necessary for survival in this town. One of my primary resources remains The Destiny of Superstitions, a book written by Kenneth Tarzal and sold at The Broken Mirror Bookstore, the shop next door to the Lucky Dog Boutique. I'm getting to know Martha well, and other Destiny residents, too, including Chief of Police Justin Halbertson and Carolyn Innes, owner of the Buttons of Fortune shop. There are other nice people in town, too--and most believe in superstitions, or at least profess to. But I don't get to know Tarzal well. He unfortunately gets murdered in Lost Under a Ladder, and since Martha is a major suspect Pluckie and I have to dig in and try to figure out who really did it. That's largely what Lost Under A Ladder is about: solving that murder. But it also describes the beginning of my journey researching and attempting to understand superstitions. There certainly are a lot of them. I'll never be done learning about them. And believing in them? I may never be sure about that. But I certainly hope I figure out what happened to Tarzal so I can clear Martha. And I also hope I achieve closure after my Warren's death. Thanks, Lorraine. The townspeople are really nice, even though they're obsessed a bit with superstitions. And I've certainly been learning a lot. Thanks, Kuzlin. I never really thought too much about superstitions before. But now... well, as I said, I'm learning a lot.